Welcome to our new Modern cabinet line! A spin off of Barker Cabinets, we launched Barker Modern in 2017. We have designed our new Modern line to have sleek lines, flush appearance, and highlight the texture and beauty of wood grain, all while offering a high degree of customization. We are able to offer this level of quality while keeping our prices extremely low by empowering the customer with comprehensive tutorials and the ability to order everything online. Our niche has always been to offer high quality cabinets at the lowest price possible. Our cabinet cases are plywood core with super durable thermally fused laminate faces. Our doors are made from imported Italian laminate panels. The degree of detail in this laminate is extraordinary, you must order a sample! 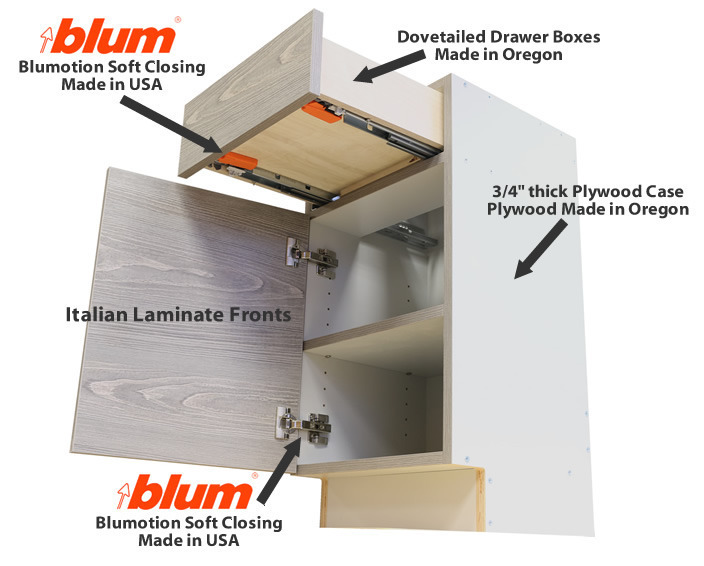 By offering the European style fronts on an American plywood core cabinet case, we are able to offer the highest quality modern cabinet available today. Pricing is extremely reasonable too. How is this possible? We do not offer design services, while instead offering comprehensive online video tutorials. By not offering the design, we are able to focus 100% on the manufacturing of the product, thus keeping our prices unrealistically low. In comparison, most other companies may, and likely do, hide their design service fees into the cost of the project/product itself. In addition, our cabinets are shipped RTA (ready to assemble). Cabinet assembly is super easy and only takes a few minutes per cabinet case. By not shipping a fully assembled product we are able to offer further savings as well as free shipping on most orders. This adds to the value of the cabinet product you will receive while allowing us to devote more of the money you pay, directly into the quality components and material that make up the cabinets themselves.